A while I go I wrote an article called Spotify is right on the spot where I described a service called Spotify that let’s you listen to music over the Internet. I was impressed of how well it worked and of how good the music player was. I’ve been using Spotify for about four months now and that has been four month of more intense music consumption than usual for me. I’ve noticed that Spotify has made me listen to music in new ways. I find myself rediscovering music I listened to 10 or even 20 years ago. I find more new music to listen to, often after being tipped by a friend but also after finding it through the applications related artists section called Artist radio. I think that the reason for my changed behavior depends on two key feature in Spotify. Since a lot of music is instantly available it lowers the threshold for finding new music. It encourages me to explore. A key factor here is the fast performance of the search box. Another important factor is that in the song list I’m able to click album name and artist name to get more information related to that. By being able to easily share music with friends also using Spotify I frequently discovers new music which increases my music interest. I think this is an interesting example of how technology changes the way we behave. This service has certainly changed the way i consume music and in the process enriched my life. That’s how it should work and I’m happy, when it on these rare occasions, do. Spotify has clearly met a latent need that I had. It would be interesting to know more about the research behind it. While I’m able to share music with others I still think it’s an area where there’s plenty of room for improvements. In the current version I have to right-click a song/album/playlist and choose Copy Spotify URI. 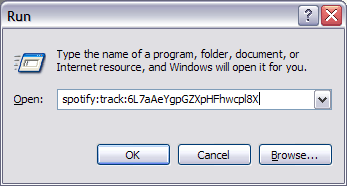 I then have to send this URI to a friend someway who have to execute it somehow, for example with Run… in Windows. I think that the natural progression should be some sort of Social aspect in Spotify. In it’s simplest form it could be being able to connect with friends using Spotify. You could then easily send them songs through the UI of the application. I think that Spotify is great. It’s made me listen to more music. Has it changed the way that you listen to music? Aha I didn’t know that! Great tip, thanks! I usually don’t post on Blogs but ya forced me to, great info.